Nick and Ofelia start cleaning up the mess from Reed's murder. Ofelia fears that this is what is normal for them now - cleaning up after dead bodies. She doesn't get to do much more because Reed has now officially turned. It seems that though he was shot in the head by Chris, Chris somehow missed the brain. Nick and Ofelia begin to panic a little bit but Salazaar charges in and pins zombie Reed to the wall using the spear poking out of his abdomen. Alone with zombie Reed, Salazaar hears a voice and starts to raise the hood covering zombie Reed's head but Ofelia pops in saying that it's time to go. Zombie Reed is bundled into a boat with Madison and she takes off for the rendezvous with Conner and his men. Conner readies himself by ordering someone to go and fetch Travis, having lost Alicia for the moment. 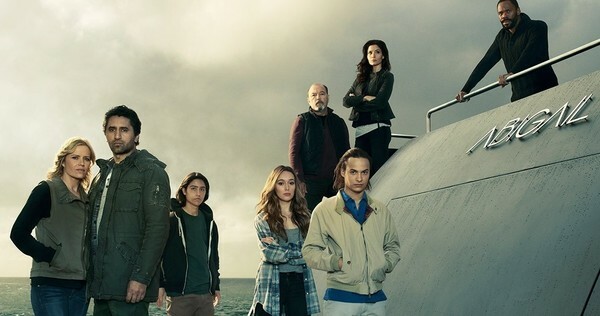 Madison approaches the dock and Conner claims that he will release Alicia after he knows that his brother is unharmed. Madison quickly pushes zombie Reed at Conner and at the same time, Conner's men push Travis in Madison's direction. Madison quickly begins to undo Travis's restraints, just as Conner pulls off Reed's hood and discovers that his brother has turned. Reed takes a chunk out of Conner's arm and another from one of his brother's men. Another of Conner's men attacks and Travis is able to take him out. High up on the roof of the ship, Alicia notices the scuffle and realises that her family has come for her. Jack pleads with Alicia to stay him, arguing that the crew of The Abigail will get rid of her, the way they got rid of Alex, the moment she gets inconvenient. Alicia apologises and slides down the ship into the water. Madison and Travis then pilot the boat close to wear Alicia landed. I thought that the story arc with Reed and Conner would certainly last longer, particularly given the big build up that it got. They were easily defeated and now the crew is sailing off to new problems. I do however think that we haven't seen the last of Jack or Alex for that matter because that woman is a survivor. I really liked seeing the development with Alicia, Ofelia and Madison (my undeclared leader). Alicia mostly keeps her calm in what is absolutely a trying circumstance. She plays Jack like a fiddle, smart enough to realise that if she has any hope of getting out of this alive, she needs to keep him on side. When Alicia finally meets up with Travis, Alicia refuses to leave without him though Travis encourages her to flea. Sure, some of her actions are in part because she blames herself for her family being in this situation; however, the important thing is that Alicia didn't get bogged down and kept her eye on the prize. Ofelia has been very much affected by her parents, Daniel in particular. Ofelia is immediately suspicious when she sees Daniel with bloody cloths, believing that he had tortured Reed. At this point, I am glad to even see a little bit of characterisation for Ofelia because she has largely been cast as the dutiful daughter. With Daniel hearing voices, I suspect that this might well be the catalyst for more development for Ofelia. Captive, affirms my belief that Madison would be a great leader of Fear the Walking Dead. At this point, she's still trying to keep the young safe and that is absolutely going to have to stop. You'd think that with the ship being invaded that this would be enough for her to realise that no one gets to sit out of apocalypse. I think the issue is that Madison still has hopes that somewhere there is some vestige of civilization left. That being said, she had no problem standing up to Strand and going off alone to save both Travis and Alicia. It's clear that she's made of some stern stuff and I want to see more moments of Madison in complete control.